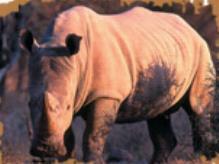 Mankwe Bush Lodge is located in Moremi Game Reserve area of Botswana. Mankwe can accommodate 156 persons and is self-catering safari Lodge. English and Afrikaans are spoken, facilities include: laundry, swimming pool, fireplace, braai (barbeque), credit cards are accepted. 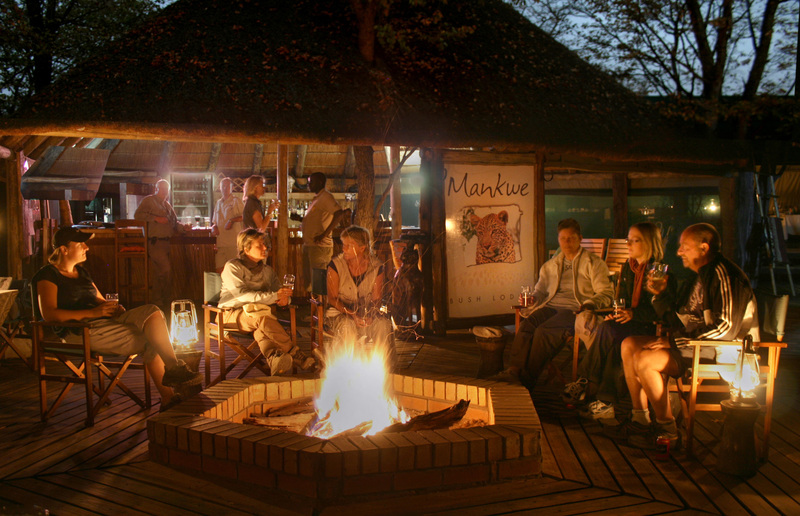 As a stopover Mankwe Bush Lodge is a must - a destination between Moremi and Chobe. Self-drive routes in own concession make Mankwe Lodge perfect for 4x4 enthusiasts. Both the Moremi Park and Savuti are within reach for a day trips, as well as concession routes up to the Khwai River which urge you to explore. 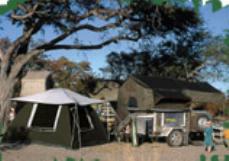 Self-catering tents and campsites are available and game drives can be arranged. Accommodation is supplied in eight Luxury Safari Tents accommodating 16 guests and seven camping sites accommodating 20 people per site, with hot water and ablution blocks. Firewood is for sale and a communal swimming pool and deck ensure that you can put your feet up in style after a long day’s game viewing. 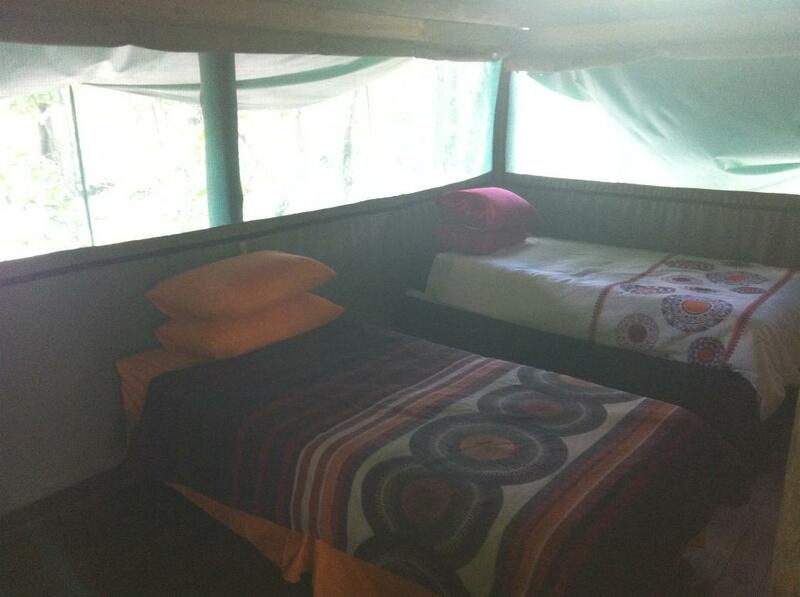 Camping sites: capacity: 20 persons per site, no power, small generators are welcome - must be switched off by 18:00. Ablution block: toilet cubicle with flushed seated toilet, shower. Staff members are on duty to clean camping sites. Each site has a water tank. Campers are allowed to use cash bar and swimming pool at Mankwe Lodge. 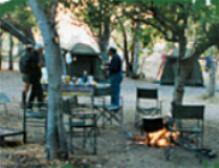 Please note that camping sites at Mankwe are unfenced and wild animals do wander through camp at times. Children are to be supervised at all times. Animal feeding is not allowed. Mokoros wooden canoes with experienced Botswana guides will take you on a tranquil scenic water ride before you sip your drinks around a bush fire on the islands, surrounded by purely African sounds. Enjoy a game drive back through the park for one more night at Mankwe Bush Lodge before you head off for your next adventure. 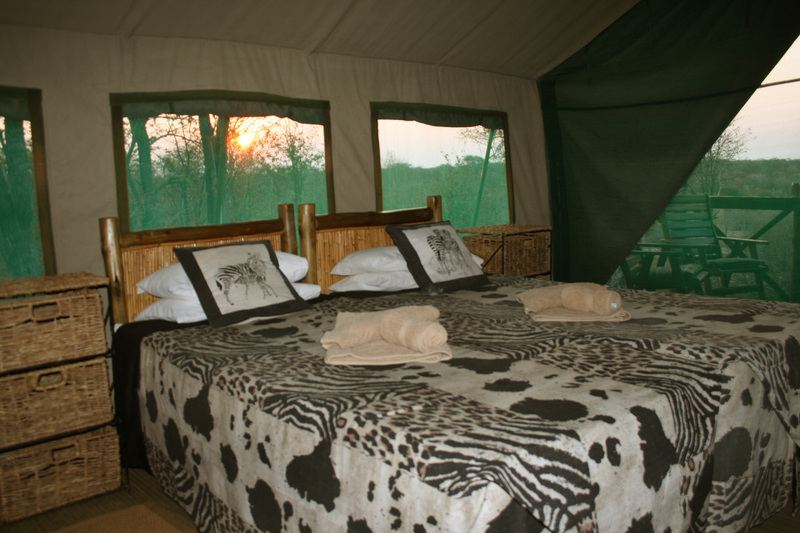 Accommodation in en-suite safari tents. Three delicious meals per day (full breakfast, lunch and dinner) and teas and coffees. Activities - Game drives in host customized safari vehicles with professional guides on host concession, to Moremi or Savuti night drives and bushwalks. 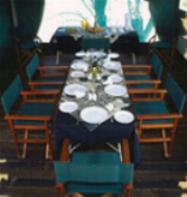 Accommodation in en-suite safari tents. Three delicious meals per day (full breakfast, lunch and dinner) and teas and coffees. Accommodation in en-suite safari tents with Mankwe linen. You supply your own food, cooking equipment and utensils. Accommodation in en-suite safari tents. You supply your own food, cooking equipment and utensils and all bedding. Eagle View is a 12 beds fully equipped self-catering unit around 1 km from Mankwe Bush Lodge reception. The unit consists of 2 floors, the one part is equipped with a kitchen. Divided by wood on stilts on the right hand side is a room with 4 beds with a toilet, shower and basin on the ground. 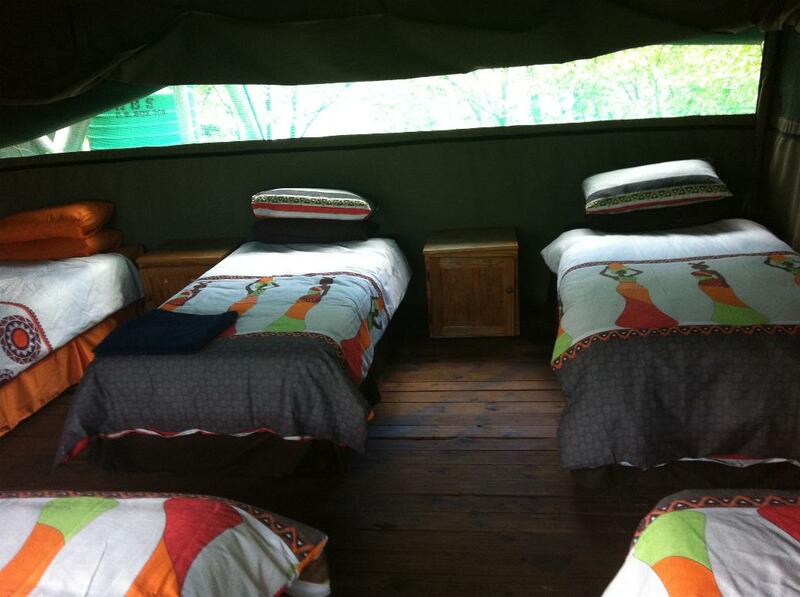 The second floor consists of an en-suite tent with a double bed and on the other side a room with 5 single beds in. 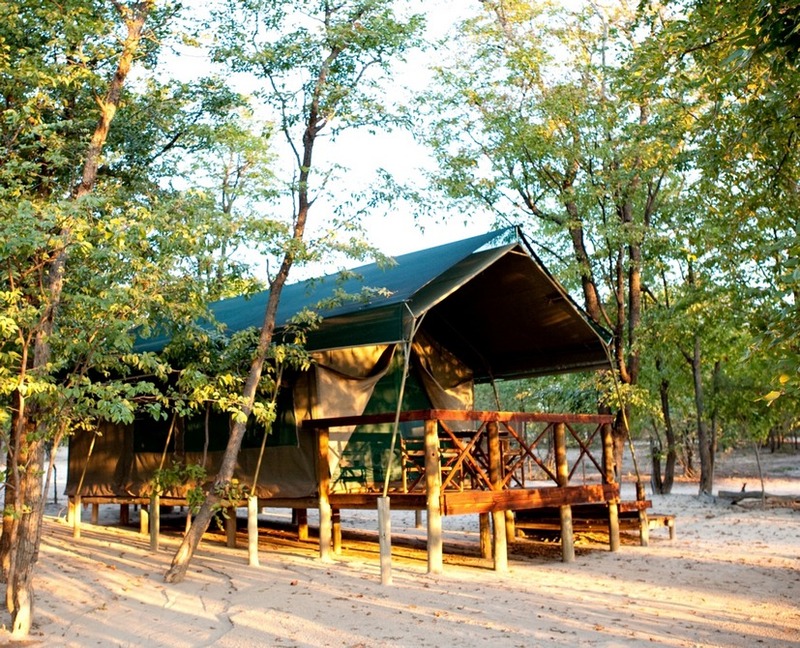 The Mankwe campsites in the NG43 concession area are ideally situated for the well-equipped 4x4 enthusiast and campers. From the campsites the Moremi Game Reserve and Savuti area of the Chobe National Park can be visited for day trips. The campsites are also in reach of the game rich Khwai River area (about 25 km away) that can be explored without costs for a day. To stay at Mankwe is like staying inside a game park as the animals move around freely and there are no fences between the reserves and host area. You are in the middle of a wilderness conservation area. As soon as the wheels start turning you are on a game drive. The ideal period to camp at Mankwe will be between 5 and 8 days as it is lovely to just stay in camp sometimes and enjoy the surrounding wilderness. For the longer stay a visit to the Delta with an overnight on an island is recommended. As establishment operate the Mboma boat station in the Moremi Game Reserve it is an experience of a lifetime to hire a boat or mokoro and do an overnight on an island in the Okavango Delta. For the more adventurous it can be lengthened to a more than one-day expedition. This is an experience not to forget. From Mankwe Bush Lodge hosts undertake game drives night drives and bush walks which should be booked with the guide which will come around to your site everyday (night drives and bush walks can't be done on your own because of safety reasons). Day trips and overnight trips can also be undertaken in host concession area. The person who would like to undertake these trips should know how to handle a GPS and be well equipped to handle any crisis like repairing your own punctures. For safety reasons these routes cannot be undertaken with only one vehicle as this is an untamed wilderness area. The Mankwe campsites in the NG43 concession area are ideally situated for the well-equipped 4x4 enthusiast and campers. From the campsites the Moremi Game Reserve and Savuti area of the Chobe National Park can be visited for day trips. The campsites are also in reach of the game rich Khwai river area (about 25 km away) that can be explored without costs for a day. To stay at Mankwe is like staying inside a game park as the animals move around freely and there are no fences between the reserves and our area. As Mankwe is situated in a migration area the animal population around the campsites will depend on the time of the year and availability of natural waterholes. You are in the middle of a wilderness conservation area. As soon as the wheels start turning you are on a game drive. As we operate the Mboma boat station in the Moremi Game Reserve it is an experience of a lifetime to hire a boat or mokoro and do an overnight on an island in the Okavango Delta. For the more adventurous it can be lengthened to a more than one-day expedition. From Mankwe Bush Lodge we undertake game drives, night drives and bush walks, which should be booked with the guide who will come around to your site everyday (night drives and bush walks can’t be done on your own because of safety reasons). Day trips and overnight trips can also be undertaken in our concession area. If you would like to undertake this it is advisable have a GPS, and be well equipped for minor repairs – such as fixing punctures. One vehicle can also not undertake this route on its own, as this is a wilderness area. Camping at Mankwe is for the camper who has got everything himself, starting with a 4x4 vehicle to the necessary camping equipment. We have private campsites where we provide you with a bucket shower (we supply a container to heat your water), a washbasin with cold water and a flush toilet. Bigger groups of up to twenty people can stay at one site. We advise campers to bring their own firewood from Maun. As the water in the tanks is not for drinking, we advise to bring your own drinking water and enough water containers. Also make sure you will have enough containers for fuel as the nearest petrol station is in Maun. Be sure to have your food and other stock planned for the period you want to stay. In short, camping at (or exploring from) Mankwe is a wilderness experience, with no 220V, filling stations, shops or bars in the vicinity. All of the above are estimated distances and the times are at average speed. COMING FROM MAUN FOLLOW THE TAR ROAD TO SHOROBE ( APP 40KM). AS YOU GO THROUGH SHOROBE YOU LEAVE THE TAR ROAD BEHIND AND GO ONTO A GRAVEL ROAD TO MAWANA GATE (BUFFALO FENCE) (APP 18 KM). FROM THE GATE YOU PROCEED STRAIGHT TILL YOU REACH THE “FORK” IN THE ROAD, KEEP RIGHT FOLLOW THE ROAD TO SANKUYO VILLAGE (APP 25KM). FROM SANKUYO TO THE MANKWE TURN ON YOUR LEFT HAND SIDE IT IS 5,5KM, TURN LEFT, FOLLOW THE ROAD TO THE LODGE (APP 2KM). PLEASE REPORT TO RECEPTION. DRIVE STRAIGHT TO 3RD BRIDGE. 2 KMS BEFORE 3RD BRIDGE THERE WILL BE A SIGN COMING FROM SOUTH GATE INDICATING TO TURN LEFT. FOLLOW THAT ROAD UNTIL YOU FIND (CLOSE TO HATAB 11) A 3RD SIGN INDICATING TO TURN LEFT AGAIN. FOLLOW THE ROAD. THE 4TH SIGN IS APPROXIMATELY 1,5 KMS FROM THE BOAT STATION. TURN RIGHT AND YOU WILL REACH THE BOAT STATION. REPORT TO WERNER THE BOAT STATION MANAGER. DO NOT FOLLOW THE MBOMA TURN OFFS AS INDICATED BY THE DEPARTMENT OF WILDLIFE, ONLY THE MBOMA MOKORO SIGN. SPLIT IS A FEW KM FROM MABABE GATE. APPROXIMATELY 410 BIRD SPECIES AT MANKWE. COMING FROM SOUTH GATE, YOU DRIVE BACK FROM SOUTH GATE TO THE BUFFALO GATE. BEFORE YOU GET TO THE BUFFALO GATE YOU TURN LEFT AND FOLLOW THE ROAD FOR 25KM TO SANKUYO VILLAGE, OUR MANKWE BUSH LODGE SIGN IS POSTED ON YOUR LEFT HAND SIDE OF THE ROAD, 5,5KM OUT OF SANKUYO. KINDLY NOTE THAT WE HAVE 6 CAMP SITES SITUATED AROUND MANKWE. EACH CAMPSITE CAN TAKE 20 PAX. THERE IS A BASIC ABLUTION BLOCK FOR EACH CAMPSITE WHICH CONSISTS OF A BUCKET SHOWER, FLUSH TOILET, BASIN AND WATER FOR DISHES, SHOWER AND WASHING UP. PLEASE BRING YOUR OWN DRINKING WATER.